Women’s Day Celebration Ideas: Making Every Female Employee Feel Special & Honored! An organization goal is only achieved through the persistent efforts of its employees. These employees work harder to make their organization cash pounds and dollars in the international markets. As women have also made a stand for themselves in the professional world, they too are contributing their own lot to the growth of their organizations. They leave their homes early in the morning to earn a living for their families and bestow their children with a good lifestyle and education. Once they reach their office, they leave their personal lives outside the office door and enter the office premises with a whole new motivation and strength. This Women’s Day, acknowledge the hard work and efforts they do for your organization and make 8th of March no less than a grand event for your female employees. International Women’s Day is a wonderful time to thank all the ladies who have been supporting your organization and making it turn into a profitable venture and a great competition for the rivals. As we say, “Behind every successful man, there is a woman”, similarly, behind every company’s growth and prosperity, there are innumerable women who are responsible for taking your organization on new heights of success. This Women’s Day, plan a celebration loaded with lots of surprises and women’s day gifts for all the beautiful and remarkable lady employees. 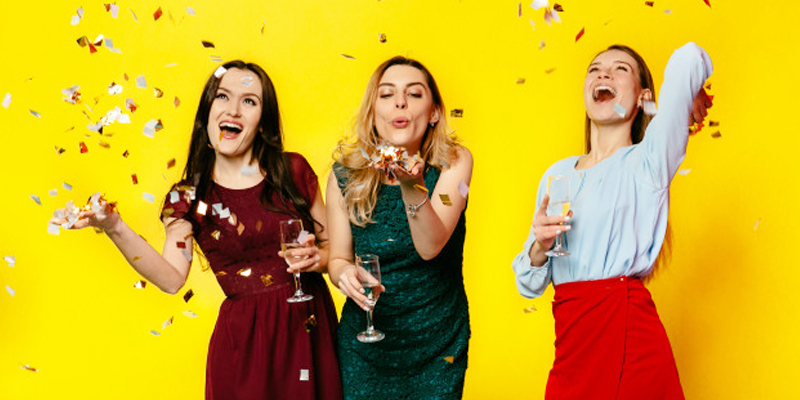 Below are some fabulous Women’s Day celebration ideas that will make a stunning and joyous organizational event ever. Book a hotel’s lounge or a posh night club in your city to celebrate Women’s Day with great pomp and show. The party music and the cozy environment of this celebration will fill the heart of all the people with so much joy and pleasure. This one is surely going to be a cool ‘Girl’s Night Out’! Hosting a dinner for all the female employees of your organization at an amazing hotel or restaurant is an excellent idea for Women’s Day celebration. Invite your female employees’ families over for this dinner to root deeper your bonds and rapport with your employees. Involving in chit chats with the families will help you know your female employees better. What can be a good start to a Women’s Day in office than applauding your female employees with captivating Women’s Day gifts! Welcoming your women employees to work by wishing them on this big day and later showering them with amazing gifts to them is a stunning celebration idea. Gifts for such occasion can be flowers, women accessorizes, apparels, personalized gifts, spiritual gifts like Ganesha idol, home decor items, etc. All women love shopping! Gifting them gift vouchers worth good money on Women’s Day is an incredible idea to make them feel rejuvenated and happy. Since Women’s Day is falling on Friday, they can take the advantages of this gift vouchers on the weekends to get their wardrobes filled with everything they want. Give your female employees a break from the hectic professional as well personal lives through this amazing gift token. This will make them feel rejuvenated and exhilarated relaxing their minds and body. This is really going to be a great getaway from all their stress and anxieties! Stunned to see such really amazing celebration ideas here! Giftalove.com is an ideal online place to order Women’s Day gifts online. It ensures timely delivery of gifts and has all kinds of gifts in its gift catalog. Have a great Women’s Day!